As you exercise you burn 4-10 times as many calories per minute as when sitting quietly, watching TV or working on the computer. Exercise also builds muscle which results in you burning more calories all day long, even at rest. 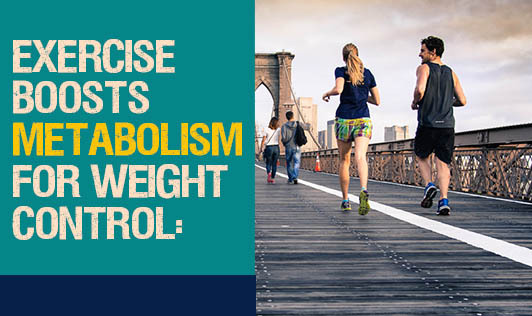 For weight loss, aim for 30-60 minutes of physical activity daily. Exercise improves your mood. Physical activity stimulates various brain chemicals that may leave you feeling happier and more relaxed than you were before you worked out. You'll also look better and feel better when you exercise regularly. Exercise promotes better sleep. Regular physical activity can help you fall asleep faster and deepen your sleep. Exercise is also important for healthy bones. Studies have shown that regular exercise, especially weight bearing exercises (like walking, jogging, and free weights) and those which promote balance (like yoga and tai chi) for at least 30 minutes every day, can reduce the incidence of osteoporosis. Suryanamaskar has a double benefit of exercise (and sunlight exposure if done in an open environment). Centers for Disease Control and Prevention. 2008.